Blended Tuna, Mackerel, Sardines, Sea Bream and Shrimp all with Tuna. The seafood is chunked & shredded and packed in a light gravy providing a nice texture and just the right amount of moisture. The moisture found in canned food for pets is an excellent way to provide hydration to the internal organs and support for urinary tract health. Perfect for adult cats and growing kittens. Ideal as an accompaniment to dry food, to feed alone or as a treat. All formulas are grain and gluten free. Available in 3 oz. and 6 oz. cans. Con: Imported, not made locally so has greater environmental impact. Review: One of my cats has a very sensitive digestive system and cannot eat many types of canned food. He likes the flavor of this food and has no trouble digesting it. The consistency is also nice in that there are chunks of seafood in each of the four kinds mixed with gravy. This causes both of my cats to slow down in their eating and gives them variety with the texture as well as the flavor. I have already recommended this product to one of my friends. Bravo! Staff comment: Solid Gold’s Tuna is imported from Thailand, as is much of the tuna found in the U.S. , including tuna found at local health food coops. Canned tuna is the second most frequently consumed seafood product in the U.S. The U.S. catches less than 1% of the worldwide tuna harvest. The major suppliers of canned tuna to the U.S include Thailand, Philippines, Ecuador and Indonesia. 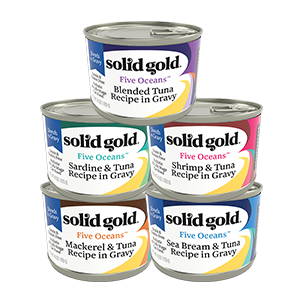 Review: I have been feeding my kitty the regular Solid Gold cans of tuna and I love the new variety with these Gravy Cans. I never like to feed the same thing over and over, so these small cans with the different flavors are just perfect. I like to make sure my kitty drinks enough water during the day. So, I will put this food in a dish and then add a little more water to it. She loves the food so much that she licks up all the food and the water. 2 Features: Grain free and low fat content. 2 Benefits: Smells good like human grade food and no more dry, flaky skin. Con: Could get very expensive if fed as daily suggested feeding amount (4-6 cans per 11# cat); so I use half a can per cat more as treat every few days. Review: This cat food is very healthy. The cats really liked every variety, but especially the Shrimp and Tuna and the Sea Bream and Tuna Recipes. My 5 year old cat licked the bowl clean and never came up for air. The 19 year old cat who has dry skin issues seems to be not so itchy since getting this ”treat” food. He eats all that I give him and that is not the case with other food we have tried. I have not seen him vomit from this which he does with other food. Con: Too small of cans for my group of cats. Had to open many cans. Smell of seafood isn’t always the most pleasant. Review: Loved that you could see the chucks of seafood, especially the whole shrimps. 2 Benefits: The finicky female cat pushes the male cat over to get to the food which means she found a wet food treat she will eat! Con: I’m not a fan of the wet cat food smell but it makes the cats come running when I open a can so it’s worth the three seconds of my inconvenience. Con: It is a costly food to feed 13 cats. Feed it daily mixed with raw, holistic meat for cats. Review: Having to feed 13 cats can be quite a challenge. Some tire quickly when feeding the same diet, others are very picky. I also have cats I show and pregnant, nursing queens from time to time. I have also found that the coats in my cats are more shiny, silky and longer. I no longer have to supplement the pregnant or nursing mommies, they can’t wait till I put the bowls down and its all gone within minutes. This is also the only food my picky show boy will eat when traveling. Previously I was pulling my hair out trying to get him to eat during a show! Con: Getting it into their bowls without the cats trying to get to it:) / Prepare meal on a high counter. Review: Have fed the SG canned Tuna for many years-Loved the addition and variety the 4 new seafood cans give. Excellent shredded texture and love the addition of the gravy! Our cats are fed a varied diet-kibble, cans, gently dried….and their weight is consistently getting to where it should be. (Both cats came into our care over weight). The canned seafood is our cats favorite!